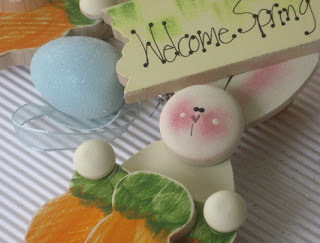 Here's just a few larger pictures of the "Welcome Bunny" featured in the Somerset Studio Spring 2009/ "Marie Vol. 1"
This is a terrific piece for someone who loves Bunnies! 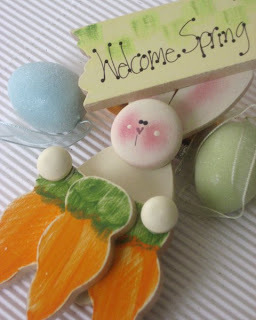 Perfect gift for Easter; or just a lovely "secret pal" gift for Springtime. I never decorate the same from season to season, year to year; so, this fella has spent some quality time decorating a wreath; the outside of a candle jar and for the summer, he was even rather attached to a large antique grater. ( Next time, I'm gonna have to share the picture of that; because, I have an electric candle hidden in the grater and the Bunny just on the outside with a big checkered bow.) He has moved around the house several times already and I'll never know where he'll end up next! So the versatility of this piece is as endless as a person's imagination!